← Ten Things I Love About Shrews. 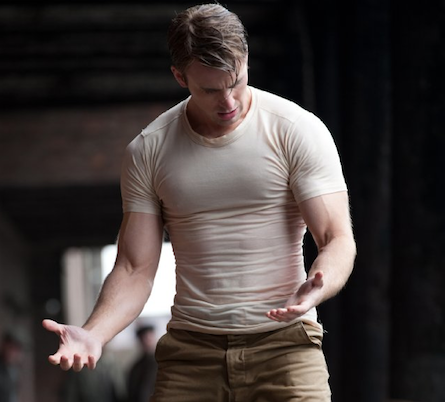 Movies: Male Body Image in Captain America. Captain America begins with the runty little Steve Rogers getting knocked back again and again for army enlistment because of his size. 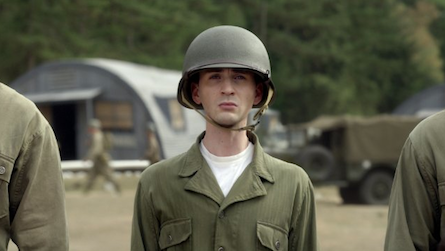 The CGI was done so well that a lot of people commented that they didn’t even know it was Chris Evans’ head seemingly Photoshopped onto a scrawny body. It’s hard to rectify the pre-Captain America Rogers with the post-Stanley Tucci experiment Captain America. Evans looked so odd for the first half an hour or so, which is a far cry from the other films we’ve seen him in: Not Another Teen Movie and Fantastic Four, where he was predominantly shirtless and acting like an arrogant douchebag. And as much as I preach that looks don’t matter, once I’d seen CGI-Chris Evans, I could not get that image out of my head! It seems Peggy Carter had no problem forgetting Rogers’ humble beginnings, though. Carter had only a short interaction with Rogers before he became a muscle-bound superhero, and only began to show interest in him after the fact. Granted, five minutes of conversation, which Rogers admits is the longest amount of time he’s ever spoken to a woman for, isn’t enough to get to know anyone. But the look in Carter’s eyes was noticeably different after he emerged from the super-soldier machine (lust, awe), than before he went into it (pity). If we want to send the message that women should be valued for more than just what they look like, shouldn’t we be sending the same one about men? Indeed, all people should be assessed based on what they offer the world and the people around them besides eye candy. Sure, the reason Rogers was allowed to enter the military after the experiment is because his physical capabilities were enhanced. Fair’s fair. But it seems Carter fell in love with the man behind the Captain America mask; the exact same man Rogers was before the experiment. The man Dr. Erskine chose for the experiment because of these traits. The baby blue eyes and the muscles just enhanced that. I’m not going to pretend that physical attraction doesn’t matter; it does. But psychological attraction is the connection that will stand the test of time. Anyone will tell you that the archetype of the comic book nerd identifies with superheroes because they’re usually the underdog. People walk all over them, not recognising them for who they are until they get a magic ring, or bitten by a spider, or made into a super-human in an experiment and can show the world what they’re made of. But why do they have to undergo a physical transformation for these traits to be acknowledged? If comic book heroes teach us anything, it’s that courage comes from within. Captain America certainly teaches us that. 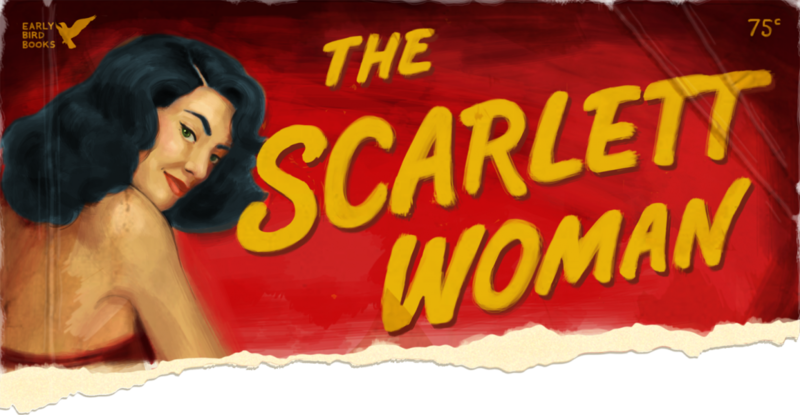 If only Hollywood adopted this strategy, too. Elsewhere: [MamaMia] Male Models. Inside Their Straaange World.